Self-Defense Classes In Montreal for Men and Women. Up until 1993 there was a question on which martial arts would be the ultimate best. It was then the birth of the UFC (Ultimate Fighting Championship). Fighters from different disciplines were locked in a cage to battle each other, under practically no rules. Royce Gracie, as the representative of Jiu-Jitsu, completely dominated the event during its first editions; defeating opponents much larger and stronger than him. From that date on, Brazilian Jiu-Jitsu established itself as the single most efficient art of combat. Nowadays, every professional MMA fighter includes jiu-jitsu training in his routine to be able to at least neutralize attacks on the ground. A Self Defense course in Montreal just for you. At our school, you don’t need to be a professional fighter to benefit from the learning of Jiu-Jitsu. We have a private self-defense program designed for the average person without any experience in martial arts whatsoever. The classes are scheduled according to the student’s convenience. We have a team of instructors to match your availability. We also encourage students to come as a group. Not only it is more fun, but it increases your commitment to finish the course and decreases your costs as well. Read below the answers to the most common questions we receive. And don’t hesitate to contact us for more info or to schedule a visit of our school. How many people can I have in a class with me? R: It is totally up to you. Our mat area can fit a group as large as 50 people so there is virtually no limitation on how many friends you can invite to do the course with you. R: It depends on how much you want to learn. We have a crash 1-hour course to teach you some basic ways to help you escape from mild forms of physical harassment. On the other extreme, you can take an 8-week course that will cover pretty much everything you’d need to know to feel safe under different threatening situations. We tailor the course according to your needs. R: Classes will be at our school on 3975 Notre Dame St. West, In St-Henri, Montreal. We are just a block away from Place St-Henri Metro Station (Orange Line). We also have our own parking lot if you come by car. Do you teach anywhere else? R: Under special circumstances, we can come to a location other than our school. Examples of those circumstances would be special events or corporate clients that want to offer the course at their workplace to employees. Tell us your needs that we will make it happen. Contact here. How long is each individual class? R: Every class is 1 hour long. But there is the possibility of scheduling more than one class, back-to-back, in order to complete the course in a shorter period of time. R: Not at all. Just come with regular gym clothes. R: The classes are designed for late teenagers and adults. For kids, we offer a different self-defense program called “Bullyproof”. There is no upper age limit. Do I need to be in shape to start the course? R: Quite the opposite actually! Even though the classes are not so physically demanding, it will help you burn a few calories and might be the spark you need to get into a healthier lifestyle. Can I get hurt doing the course? R: Highly unlikely. There are no sparring sessions in this course and you will practice the techniques under close supervision of the instructor. However, if you have any particular health condition, we encourage you to consult a physician before starting any physical activity. Will I learn how to beat someone in a street fight? R: Jiu-Jitsu is a martial art that preaches non-violence, and the resolution of conflicts without the need to engage in a fight. 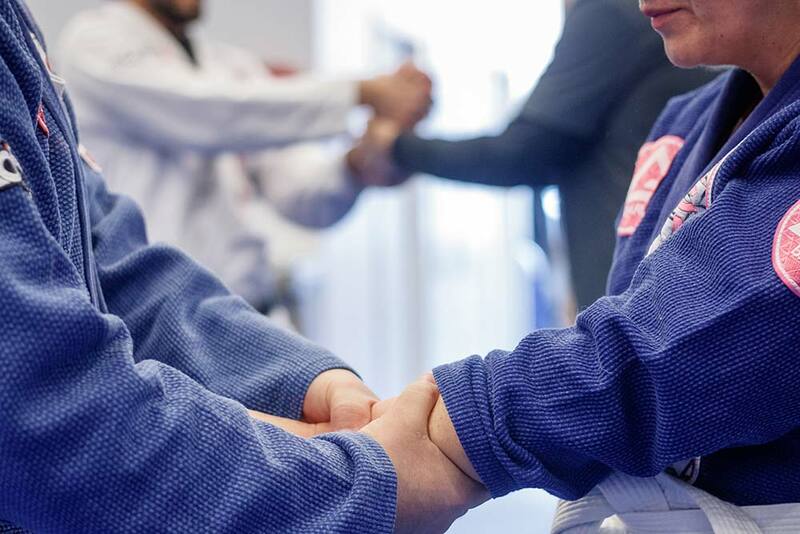 The goal of self-defense from a Jiu-jitsu standpoint is to make you safe under attack and eventually control the aggressor without causing harm. If you want to learn how to beat people up on the streets, this course is not for you.